Impromptu Speaking — Speak Unprepared Without Fear! 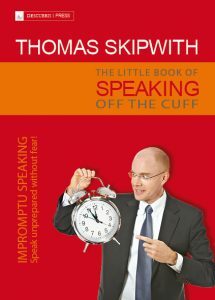 If you always wanted to easily speak of the cuff this little book is for you. Thousands of workshop participants have successfully implemented the techniques in this book. You too can learn to give a great impromptu speech without preparation. Those moments when you get called upon to say something and you are tongue-tied are embarrassing. Some stand there stuttering, have sweaty hands and have a pulse rate of 200. This can be avoided. This little book gives you clear how-to-instructions. Title: The Little Book of Speaking Off the Cuff. Impromptu Speaking — Speak Unprepared Without Fear! Order it at www.amazon.com or iTunes. Rarely does a speaker commend such attention. Christine Lagarde, the managing director of the International Monetary Fund, provoked a demonstration in front of the University of Zurich: Students opposed to the policies of the International Monetary Fund IMF had their transparencies with them (see picture above). The campus therefore abounded with security personnel. 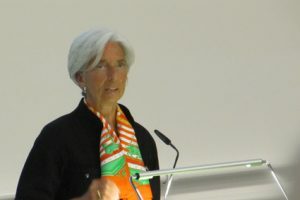 But there were also several hundred people who had come to listen to Mrs. Lagarde share her views of how to manage the currently difficult situation of world finances. There were so many that the speech had to be broadcasted into several other lecture rooms. To have a better future for all, she argued, there must be growth in the short, medium and long term. Each country should implement a customized number of policies including the areas of banking, housing, taxes, product and labor markets. In addition the entire world economy should be rebalanced and secured with a financial safety net. She insisted that growth and austerity are not mutually exclusive, but can work together. 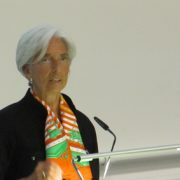 What about Mrs. Lagarde’s presentation skills? She has many strengths (+) and a few areas for improvement (-). + Eye contact: She had her material down cold. Therefore she could at anytime look into and connect with the audience. – structure: On the one hand very structured, but then so many subpoints, that she lost me. – Too few anecdotes: I wish she had packaged her key message “growth and stability are not mutually exclusive” into a memorable anecdote or picture. – Call for action: At the end of her speech she could/should have had a call for action. Did what she said convince me? Not entirely. For me it was too general and too high level. As Christine Lagarde said: “The proof of the pudding lies in the eating.” Hope dies last. All in all she made a very confident, eloquent and elegant impression on me. How did Mrs. Lagarde fare on the Skipwith Radar, a measure for presentation skills? 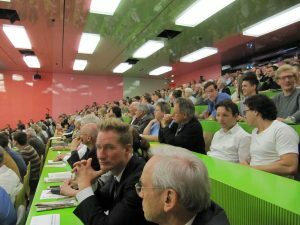 Listen to the speech at www.siaf.ch. Interested in public speaking and presentation skills? Check www.descubris.ch for presentation training and presentation coaching. 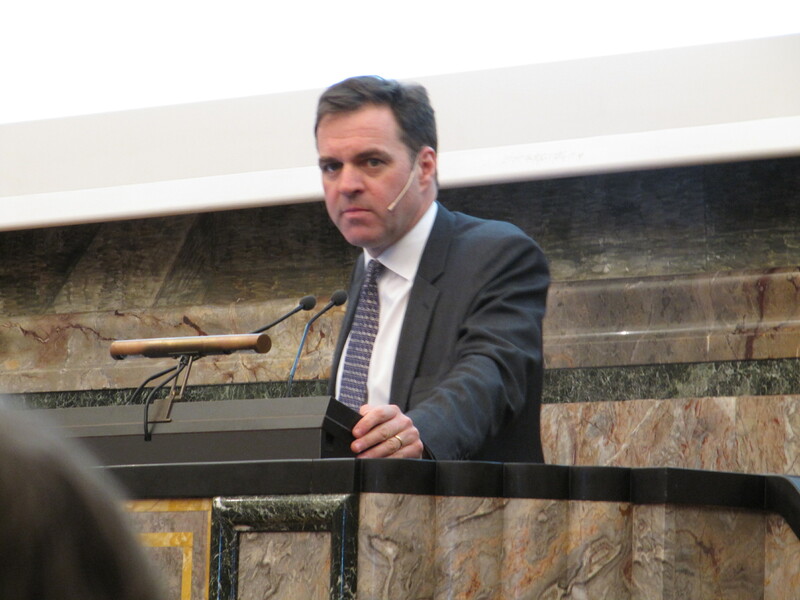 In my humble opinion, Niall Ferguson is a master of public speaking. Or so he was at his lecture in Jan. 30, 2012 at the Swiss Institute of International Studies. He did practically everything a good speaker and orator should do. His material, delivery and setting were perfect. Rarely do we hear someone in Switzerland that speaks as well as he does. First of all, he spoke almost without notes. Only barely did he peek at them, only every two minutes, or so it seemed. I particularly enjoyed seeing someone who owned his content. It came right from the heart. No searching for words or thoughts. All smooth and continuous just like the water flow from a water fountain. Some would say he spoke so well in spite of not using PowerPoint. I say he spoke so well because he DIDN’T use PowerPoint. He spoke in an auditorium where Winston Churchill spoke in 1946. Churchill then said “Let Europe arise.” Ferguson referred not only to that sentence (unfortunately Europe seems to go the other way), but also referred several times to Churchill with quotes and analogies. Ferguson started his speech in fluent German. Then switched to English. Obviously I was impressed that a Scotsman would speak, forgive my ignorance, any foreign languages at all. Also forgive me due to my American heritage when I say he spoke with a bearable accent, albeit somewhat British. Clearly, slowly, with pauses. He must be a university professor – but a good one. Jokes aside, he articulated like Demosthenes after practicing with the marbles, his use of words was varied, his analogies to the point, Ferguson even used voice variation when he imitated Churchill’s voice. Ferguson also expertly connected to recent events, i.e. the World Economic Forum WEF in Davos. An event that was fresh in the minds of most of the audience members. 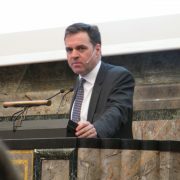 Expertly, Niall Ferguson used the analogy of killer apps to explain what made Europe such a power house for 500 years. The killer apps were (1) the principle of competition, (2) the scientific revolution, (3) the rule of law, (4) medicine, (5) the consumer society, (6) the work ethic. He claims that while Asia in particular is implementing these killer apps (they downloaded them), Europe and the West is in the process of deleting them. Prof. Ferguson was also master of the Q&A session. He even managed to incorporate the sound of the siren of a passing police car into the answer of one of the questions. 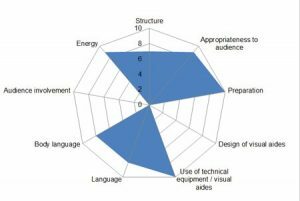 No need for a Skipwith radar chart. He gets 10/10. If he has a fan club: He can count me in. Interested in public speaking? 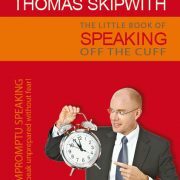 Check www.thomas-skipwith.com for training and coaching.